Foal 1st Caermynydd Lisa J Gwynn Jones, Awelon, Capel Seion. 2 Year Old 1st Barracks Patsy I Jenkins. Pennant, Rhydycymerau. CHAMPION : BARRACKS PATSY. I Jenkins. 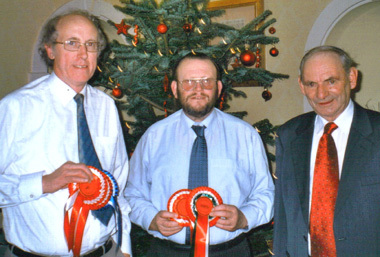 On the left is Mr Gwynn Jones with rosettes for the mare and foal points winners. 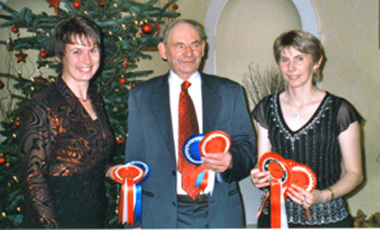 On the left is Mrs Teresa Ford collecting rosettes on behalf of Cwrtycadno stud. 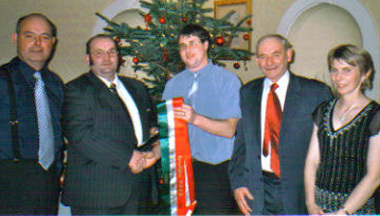 CHAMPION : LLIDIART LOUIS. Angharad Flur, Bow Street, Aberwstwyth.